Last week, I attended EFFEN Vodka‘s Art of Design. I would have the opportunity to taste drinks and vote for my favorite. However, once I got there, I was named a judge. 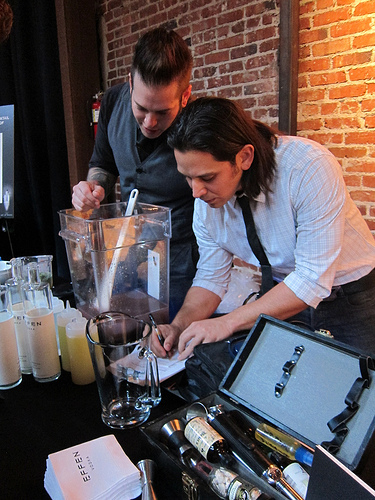 I’ve judged other cocktail contests before and I always find it fun. 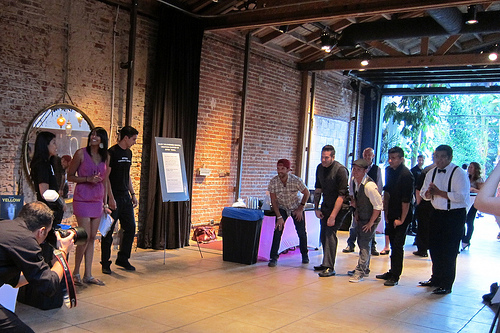 The event was held at the Marvimon House on the edge of Chinatown. Having grown up in Chinatown and just around the corner from Marvimon, I was rather surprised how beautiful the space was. They are managed by the same company that also has Smog Shoppe in Culver City. My cousin had gotten married there earlier this year and I could see the similarities between the two. I particularly loved the giant horseshoe over one of the bars. The evening also featured art, jewelery and fashion via the many lifestyle writers in attendance. It did not feel like the typical Hollywood experience but rather more other-worldly. 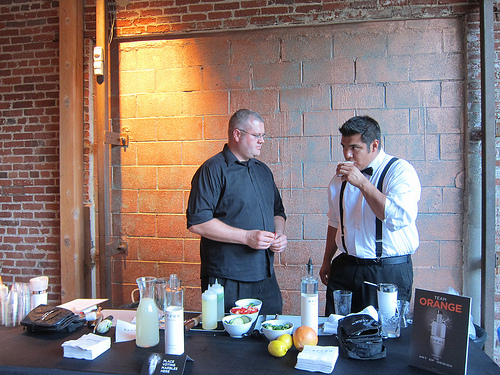 Guests were invited to try their hand at making a Effen Cucumber drink by selecting fresh ingredients. I opted for an Effen Cucumber, grapefruit, watermelon and thyme drink. It was delicious. They were also passing around cocktails made from recipes developed by the contestants earlier. 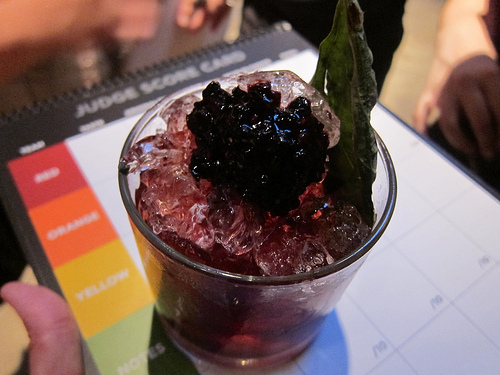 Amanda Gunderson from the Bazaar at the SLS Hotel won the Facebook Fan Favorite award for her drink, Sunday Funday. The MC and fellow judge bar owner Dave Whitton explained to me the rules. There would be five teams of two bartenders. Each team was headed up by a well-known bartender and the budding mixologists worked with them to come up with a winning recipe. 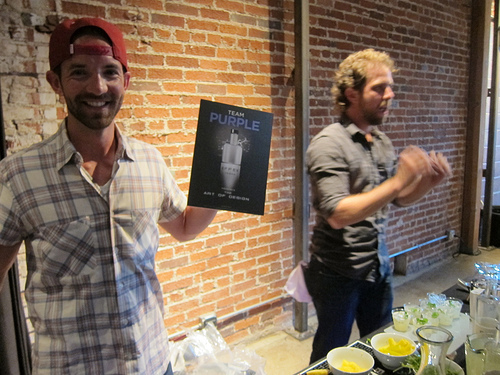 The bartenders raced for ingredients and then had 20 minutes to come up with the recipe. They had to batch the drink immediately for the large crowd. Watch the bartenders race here. 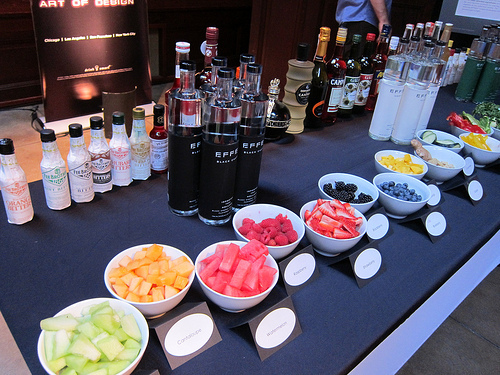 I found it interesting the bartenders nabbed bowls of fruit and other fresh ingredients and generally ignored the other spirits. This was a good sign. They wanted to play up the vodka and not lean on other strong liqueurs or spirits. Over in the corner, Team Red had set up shop. Stephan from the 213 Group was paired with Tyler Dow. They came up with the Effen Smash. I felt the Effen Smash (Effen, blackberries, basil, lemon) was a bit more like a cobbler. With the smashed blackberries piled on top of the drink, it was a bit difficult to get to the drink. It definitely needed a straw. I initially had tasted the drink in a smaller plastic cup and it was much better in a real glass. Lugino Bonsera (aka Sonny) from Villains Tavern and Roger Room‘s Jason Bran were busily figuring out the recipe and probably doing some math to properly batch the cocktail. Check out Jason’s bar kit. Sonny told me about their drink, the Old Thymey Blue which was made with Effen, falernum, blueberries, peach bitters, thyme. This drink would win the people’s choice. 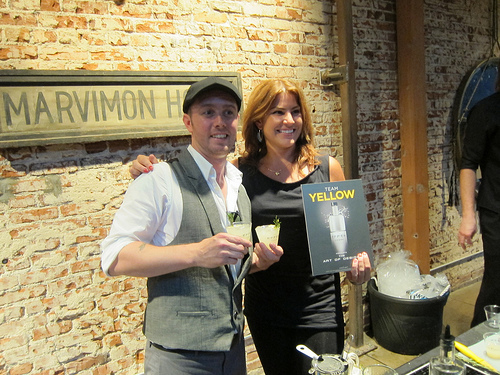 Team Yellow was comprised of Justin Stidham from Wood & Vine and the aforementioned Amanda Gunderson. 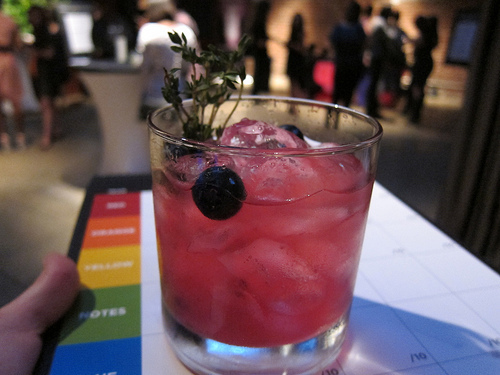 Their Smooth Operator with Effen Black Cherry, ginger, rosemary, lime, simple syrup was the judges’ favorite and won the contest. It was a bold move on their part to use the Effen Black Cherry. It was very refreshing and I know at least one other judge quite in love with the simple but nice looking garnish. 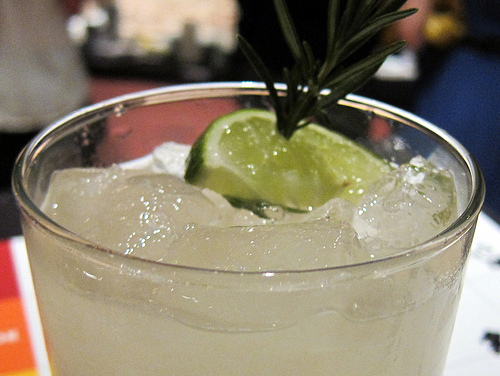 Piercing the rosemary through the lime is very classy. I do have to say though I was very much impressed with Team Purple’s cocktail. Leading the team was Joel Black and Curtis Harrier from the new Shore Bar. Curtis is the lead bartender there and also works with Joel. 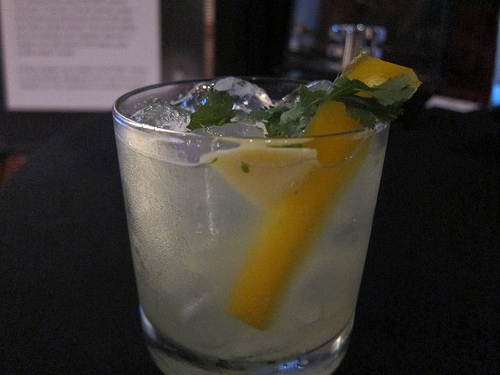 They came up with the Mango Tango with Effen, cilantro, yellow bell peppers, mango, lemon sour. I’m pretty much a sucker for drinks with bell pepper. The drink was very complex and multi-layered starting with a bite of cilantro and swimming towards mango and ended with a beautiful bell pepper. 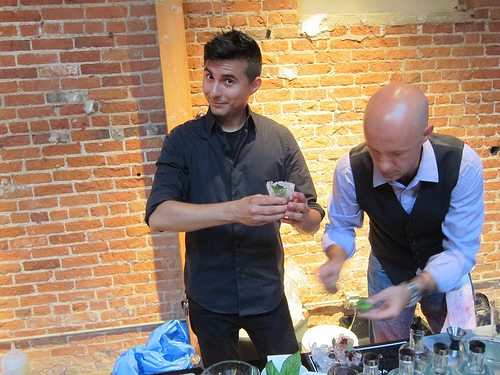 Roger Room‘s Damian Windsor was paired with Steven Flores, a freelance bartender. 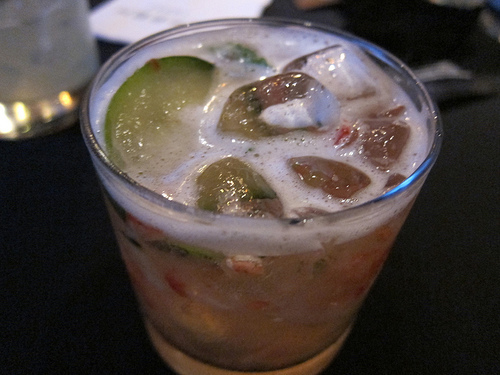 Their drink, 99 Degrees in the Shade with Effen, strawberry, jalepeno, mint, cucumber, simple syrup was an absolute classic. Slightly spicy with the summery mint and strawberry. Dave Whitton wanted to rename it 99 Shags and when I asked Steven about it, he said I could call it anything I wanted. Ha, let’s keep it 99 Degrees in the Shade which seemed like a prediction of the hot weather LA has been having. Congratulations to Justin and Amanda! This entry was posted in alcohol education, alcohol tasting, bar stories, bartenders, cocktail competition, cocktails, contest, events, hot bartenders, la, la cocktails, los angeles, spirits, the minty and tagged 213 group, amanda gunderson, art of design, bazaar, cocktails, curtis harrier, damian windsor, dave whitton, effen art of design, effen black cherry, effen cucumber, effen vodka, jason bran, joel black, justin stidham, ludino bonsera, lugino sonny bonsera, roger room, shore bar, sonny bonsera, steven flores, summer cocktails, the minty, tyler dow, villains tavern, vodka, wood & vine. Bookmark the permalink. I’m a little disappointed by your lack of whack dress photos. 😉 Great pics! All the drinks sound fabulous. Hahah…I’ll leave the fashion writing to the fashion bloggers.